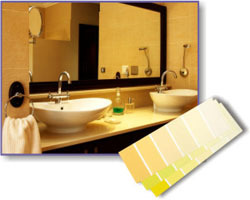 Bathroom colors in all the splendid varieties and combinations are an integral part of bathroom designs that work. 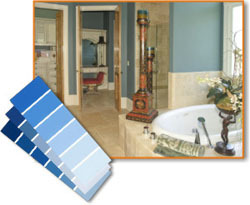 Understanding and applying the basics of color theory is just the first step in creating your bathroom color schemes. 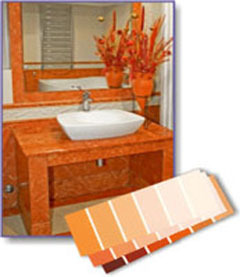 Experimenting, having fun with color and adding your unique touch to create your designer bathroom, will be the ultimate reward. 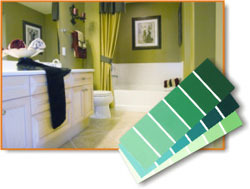 Which other rooms and their color schemes should be considered when choosing your bathroom color? 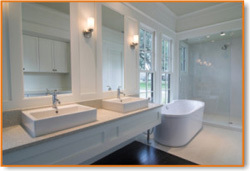 A bathroom leading off the master bedroom should be part of a harmonious color scheme. In a powder room you could be more adventurous with your choice of color, but it should still fit in with the overall style of the house. Which color do you absolutely adore and would you love to live with? Choose the ideal hue of your favorite color by taking the time and effort of painting large swatches to see which one works best. 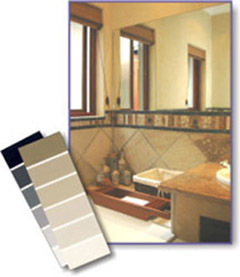 Fixtures, tiles and flooring will be there for a long time - will your choice of color withstand the test of time? If you don't want a long-term commitment to a single color, go for a neutral background that can be easily enhanced with the addition of accessories in your favorite color, whatever your mood, the season or the latest trends. 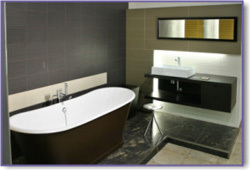 Lighter colors will make a room appear larger, whilst darker colors will be more dramatic and intimate. What effect do you want to create? Use different hues, shades and tints of your favorite color to build up a rich and layered palette. You may want to use soothing colors and create a harmonious palette. 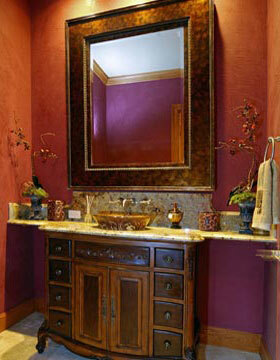 Or, you may want to make a bold statement with deep hues or vibrant colors. 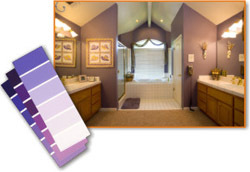 There is no specific rule about the right or wrong colors for bathrooms! We all look at colors in a subjective way. 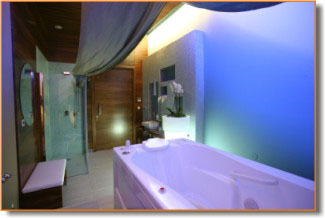 Colors are evocative and will bring out different emotions or reactions in individuals and modern bathroom design is open to interpretation. Primary colors are red, blue and yellow as contained in the inner circle. Primary colors cannot be mixed from any other color, but by mixing the primary colors, you can make up all the other colors. We'll show you how even primary colors can be used successfully in a bathroom. 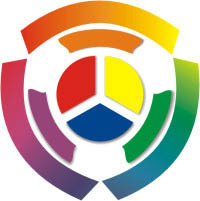 Secondary colors are created by mixing two primary colors as can be seen in the second circle. Tertiary colors are created by adding more of a primary color to a secondary color. And this is where it gets interesting when you start playing around with different hues. Tints are produced by adding white to colors. Shades are produced by adding black or grey to any of the colors. When planning your bathroom colors, it is the effective use of complementary (or contrasting) colors that can add the professional touch. Complementary colors are always opposite one another on the color wheel. 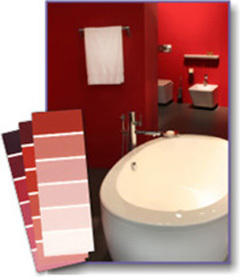 Have you chosen your favorite bathroom colors?